If you are wondering why oak is such a popular choice for flooring you should know it is thanks to the fact that it is affordable, relatively hard which means it could be hard to dent due to falling objects and heavy furniture and it looks great with just a clear coat of sealant without any additional staining. 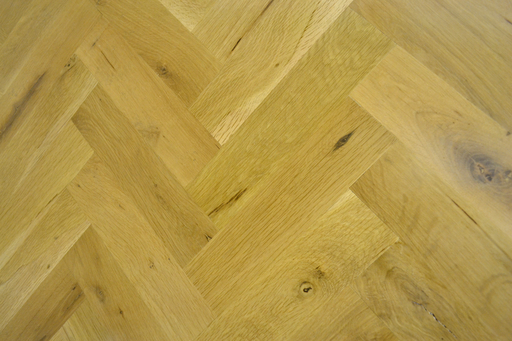 Choosing Oak wood in the form of solid parquet blocks can give you a different feeling over simple floorboards as the small sizes make the wood more compact and able to form patterns and reduce the natural timber defects as they get cut out. These specific parquet blocks have measurements of 20 mm thickness, 70 mm width and 230 mm length and their flooring grade is rustic which means the planks you receive, although from the same wood, will have colour variations and different size knots. Book qualified installers for your for only £00.00 excl. Vat, based on the Size of room specified above. Price is excluding of Flooring accessories and other services. Unfinished products will require additional sealing & finishing service, not included in this quote. Our Final installation Quotes come with 2 Years Service Guarantee and are subject to an Obligation free site visit (currently London areas only). Smaller sized areas (below 15 sqm) will be subject to a minimum charge.